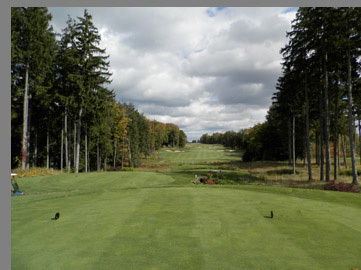 Shenendoah Golf Club at Turning Stone in Verona, New York is a dream course to play. 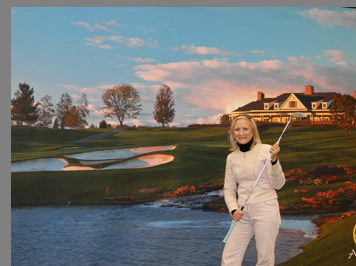 "The Adventure Kids" aka Debra C. Argen and Edward F. Nesta played the stunning 18-hole PGA championship golf course designed by Rick Smith on a beautiful autumn day and look forward to playing there again. Constructed and maintained to TOUR standards at more than 7,000 yards, Shenendoah Golf Club opened in 2000, hosted the PGA National Club Professional Championship in 2006, and since then has earned numerous awards and accolades including: Top 100 Courses You Can Play, Best Golf Resort in the Northeast, Top 100 Best Resort Courses, and Top 50 Courses for Women, to name but a few. 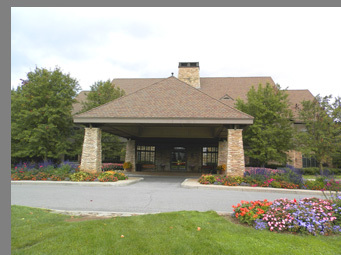 We stayed at The Lodge at Turning Stone in late October 2014, and took advantage of the beautiful autumn weather and the course's proximity, (it is located adjacent to the hotel), to play a round of golf with Golf Pro Eric Lorenzetti at the immaculate Shenendoah Golf Club with its rolling greens and stunning vistas framed on either side of the course by a stand of trees wearing their most brilliant autumn colors of gold, red, orange, and rust. The course was a dream to play with its wide open fairways and offered 5 sets of tee boxes to appeal to a wide range of handicaps. 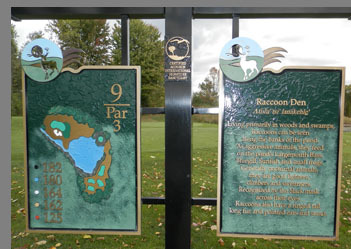 Each of the holes listed its name in English as well as in the Oneida language and had a legend at each of the holes that described its uniqueness. 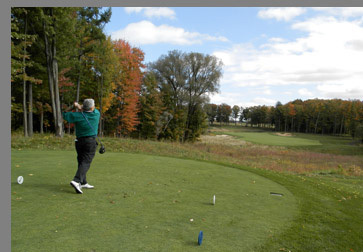 "Shenendoah offers 18 holes of PGA-level golf in a spectacular natural setting. The course was built and is maintained to comply with stringent Audubon International standards for environmental protection and preservation. Designer Rick Smith used the natural landscape to create wooded parkland holes, open pastures that capture the links feel, and beautifully simple low country-style holes." We started with a walkthrough of the fully fitted out golf shop at the Clubhouse to purchase any last minute items, and then met with Golf Pro Eric Lorenzetti at the check-in desk. 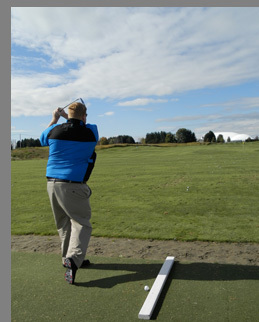 Eric suggested a warm up on the extensive driving range followed by a handful of putts on the putting green. Warmed up and ready to go, we drove to the first tee and met with the starter before beginning our Shenendoah experience. 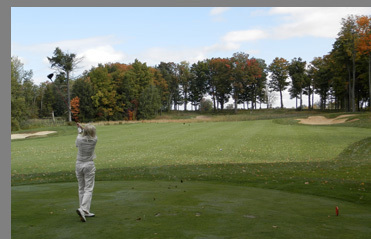 The course opened with a par 4 named Sugar Maple where sugar maple trees dotted the landscape, with tee boxes set up at 416, 386, 374, 318, and 250, rated a women's handicap of 9 and a men's handicap of 5, this was a challenging opening hole. Hole 2, Little Blue Stem, was another par 4 with tee boxes set at 408, 378, 358, 346, and 320, with the legend describing it as "re-grassed with the native Little Blue Stem, this tee has improved in its beauty and wildlife habitat, thus improving the course and the golfing experience. Similar in appearance to golf courses in Scotland, the blades of grass are green, but turn reddish-brown when mature. Tree swallows and Red-tailed Hawks are often spotted on this tee." Hole 3 Black Willow was a long par 4 with tee boxes set at 452, 407, 402, and 364, and is rated the hardest hole for both the women's and men's handicap. We followed up this challenging hole with Hole 4, Marshland, which gave us a brief reprieve with tee boxes set at 364, 338, 312, 277, and 265 and which is rated 17 on the men's handicap and 7 on the women's handicap. Every golfer has their "dream shot" of the day, which goes a long way when it comes to playing a challenging, long championship course. (For Debra), hole 4 was the dream hole, when you hit the ball and you hear the lovely note of hitting the sweet spot where the lift is right and the ball carries beautifully on the wind. That one shot set up the rest of the course play. Hole 5, Deer Crossing, a par 5 was a demanding hole with tee boxes set at 567, 552, 541, 512, and 402, then segued into a par 3 for Hole 6, Tamarack, with tee boxes set at 186, 161, 156, 131, and 103. 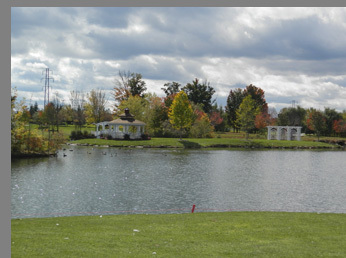 Hole 7, Lake View, a par 4 offered an exceptional view of the golf course's scenic lake, with tee boxes set at 398, 392, 378, 316, and 282. Hole 8, another Par 5 pushed our ability with tee boxes set at 539, 494, 458, 452, and 380. Hole 9, Raccoon Den, the halfway mark, gave us another distance reprieve with a par 3, with tee boxes set at 182, 180, 164, 162, and 125, although it was an "over the water" hazard hole. Hole 10 Flying Squirrel was a longer par 5, with tee boxes set at 506, 484, 458, 434, and 392. Hole 11, Black Ash, was a par 4 with tee boxes set at 448, 396, 360, 34, and 288, followed by Hole 12, White Pine, another par 3, which was the shortest hole of the course with tee boxes set at 187, 174, 142, 117, and 106. Hole 13, Hard Fescue, a par 4, picked up the distance again with tee boxes set at 420, 413, 391, 355, and 337, followed by Hole 14, Fox Den, another par 4, with tee boxes set at 494, 464, 448, 398, and 398. Hole 15, Snapping Turtles Passage, although a par 4 was a shorter hole with tee boxes set at 354, 338, 304, 274, and 270, and with a men's handicap of 18, denoting the "easiest" hole for men on the course. Hole 15 was my (Edward) best hole with a nice approach shot, followed by a crisp iron to the green where a 2 putt resulted in a rewarding par. Hole 16, Red Maple, another par 4 had tee boxes set at 427, 403, 383, 372, and 313 and offered a stunning view where the bunkers acted as directional guidelines, yet somehow (Debra) found her way in and out of the "beach." Hole 17, Whitetail Deer, was the longest of the par 3 holes, however there were no hazards, and had tee boxes set at 228, 198, 192, 180, and 160. Hole 18 Apple Orchard tested our mettle for the last hole with a par 5 and tee boxes at 553, 527, 507, 489, and 430, to bring us on home after a very memorable day of golf at Shenendoah Golf Club. Shenendoah Golf Club was designed to challenge, excite, and stimulate the senses, and indeed it was true. We cannot wait to play there again. 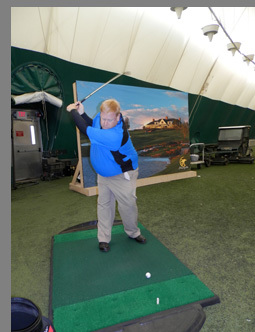 After our round of golf and lunch at the Clubhouse at Shenendoah, we visited the Golf Dome, which opened in 2005, has 40 hitting stations, 2 simulators, a short game practice area, and Golf Superstore at Turning Stone that opened in 2012 and has a diverse selection of golf equipment, apparel and accessories for adults as well as junior golfers. In addition to Shenendoah Golf Club, Turning Stone Resort Casino also has 2 other championship courses. 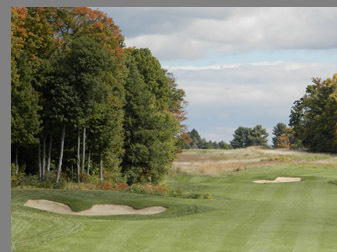 "Atunyote, the longest of Turning Stone Resort's three championship courses at 7,315 yards, this Tom Fazio design was home to the Turning Stone Resort Championship from 2007 - 2010. In 2006 it was the site of both the PGA Professional National Championship and the BC Open. Atunyote's parkland setting features vast stretches of open space, gently rolling hills, a stream of small waterfalls, and several lakes. Walk the fairways that past champions Tiger Woods, Camilo Villegas, Matt Kuchar, Steve Flesch, and Dustin Johnson have all walked." "Kaluhyat, measuring in at just over 7,100 yards, this Robert Trent Jones, Jr. course was ranked one of the Top 100 Best Resort Courses by Golfweek in 2010. One of the toughest courses in New York, Kaluhyat is marked by dramatic changes in elevation, measuring as high as 50 feet in some areas, with plateau settings offering seemingly endless, spectacular views of the surrounding terrain. Six lakes throughout the course add to the picturesque setting. Kaluhyat is a classic shot-maker's course, where accuracy and strategy are rewarded as much as length." Turning Stone also has 2 other courses. 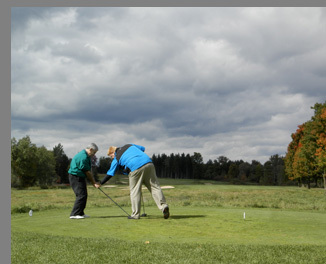 "Pleasant Knolls is a player-friendly recreational course, offering a relaxing nine holes of par 36 golf. Sprawled over 70 acres, Pleasant Knolls features wide-open fairways, fast greens, challenging water hazards and gently rolling terrain." "Sandstone Hollow was built with the busy golfer in mind. The result: a nine-hole, par three course that winds through woods and wetlands, with greens surrounded by wild fescue grasses and rock outcroppings. This isn't a pitch-and-putt course. Designed by Rick Smith, Sandstone Hollow is rated among the top 25 par three courses in the USA by Golf Event magazine - and Sandstone Hollow will push your game to the limit." Shenendoah Golf Club at Turning Stone is conveniently located in Central New York 23 miles from Utica, 35 miles from Syracuse Hancock International Airport, 112 miles from Albany, 115 miles from Rochester, 177 miles from Buffalo, 259 miles from New York City, 280 miles from Boston, Massachusetts, and 286 miles from Philadelphia, Pennsylvania. Read more about our experience staying at The Lodge in the Hotels and Resorts section, about our dining experiences at Wildflowers and TS Steakhouse in the Restaurants section, and about our experience at Skaná Spa in the Spas section. Read Chefs Recipes section for interviews and recipes from Chef Dustin Tuthill of Wildflowers and Chef Steve Batur of TS Steakhouse at Turning Stone. © December 2014. Luxury Experience. www.LuxuryExperience.com All rights reserved.